"Within an hour I was on my way to Aiai creek-and my Waterloo". Also known as Yai Yai Creek and Ya Ya Creek, the creek is not named on Finlayson's 1935 map of the south western portion of Central Australia, widely acknowledged as the best map of the era, and Coote's spelling will be used in this entry. This usually dry watercourse has been mistakenly named by Blakeley as 'Taylor's Creek'. The creek was a significant location in the expedition's travels and Coote correctly named and placed the creek in the "shadow of Mount Liebig", Blakeley supposed the creek had a name but not knowing this (or apparently its location) named it after Phil Taylor, the expeditions mechanic and driver, and confuses it's location and and the unfortunate events that occurred there, with the Dashwood, some sixty miles to the east. The expedition arrived at the steep eastern bank, late in the morning of Friday, the first of August 1930, (the same day Michael Terry and his mates arrived at Ayers Rock) and spent some time searching for the easiest way across, there was not much choice, and the men set about cutting down the steep banks and corduroying a track across the sandy bed. Colson crossed first in his Chevrolet truck, Sunrise, and when accelerating up the steep western bank in second gear, he striped the differential. The truck was beyond immediate repair and had to be pushed off the track by the Thornycroft, the lumbering six wheeler in the hands of the now expert Philip Taylor making the crossing without effort. Blakeley had no choice but to wait for several days, until Coote and Colson returned in the Golden Quest with the necessary spares, as his leave had almost finished, the Captain took the opportunity to return to Alice Springs and the three men turned east in Colson's sedan shortly after lunch. Blakeley and the four remaining men established a comfortable camp near the broken down truck and made preparations to clear an airstrip. It was a dirty tiring job cutting through the Mulga, one of Australia's toughest trees, until Mickey speeded progress by discovering that it was easier to dig under the umbrella mulga and cut the trees out by the roots. As he had hoped, Blakeley found Lasseter "much easier to manage", now that Coote, Colson and the Captain had left, and noted that Lasseter "went out of his way to make things pleasant". He worked really hard clearing those trees. "As a matter of fact he always did his bit, and was never far behind everyone else". Certainly Lasseter was feeling more comfortable and perhaps safer, now that three men he distrusted for various reasons were out of the way, and it might be that Blakeley and Sutherland would be easier to influence without the interfering Coote. The first night at Ai Ai Creek was a happy camp, heightened by the thorough enjoyment of the absent Captain's little joke at Sutherlands expense. Next day, the 2nd of August, the five men put the finishing touches to the airstrip and by mid afternoon Taylor has pronounced the strip suitable for the plane. Blakeley and Sutherland found time to do some prospecting and to search for water along the creek, but without success. Blakeley considered water rationing but was not overly concerned at this stage, and except for the plagues of flies and ants and the delay waiting for Coote's return, it is a pleasant enough second evening camp. Coote and Colson arrived over A Ai Creek on the afternoon of the 3rd of August and Coote was immediately uneasy about the size of the landing ground, "Big enough for a model plane" and made a hazardous but safe landing. A very queasy Colson struggled from the plane and retired to his bunk for the afternoon while Taylor started repairs on Sunrise. He had the vehicle in operation that evening and all vehicles were loaded for an early start in the morning. After tea, plans were reviewed for Coote and Lasseter to check Lasseter's landmarks from the air the following morning. Next morning, in the "cold light of dawn" Coote wisely advised Lasseter to wait while he tested the airstip, "There's no use two of us getting skittled" and just as well. The aircraft clipped the trees at the end of the runway and a small branch snagged the lower right wing, Coote circled for some time to gather his wits and finally made a slow and cautious landing but overshot the runway and almost crashed the Golden Quest into Ai Ai Creek. The badly shaken pilot then discovered that the plane was leaking fuel and the engine racing, he refused to fly until the problems were fixed and the versatile Taylor set to work, it was mid morning before the expedition was on it's way to Illbilla. Coote and Colson returned to the airstrip on 9/8/30, it was Coote's intention to fly the plane to Illbilla and Colson to continue on to Alice Springs with the mail. It was late afternoon before Coote considered the runway sufficiently lengthened to attempt a take off, against Colson's wishes. This much cleared airstrip was finally Coote's undoing and he crashed the plane on take off, totally destroying the Golden Quest and barely escaped with his life. 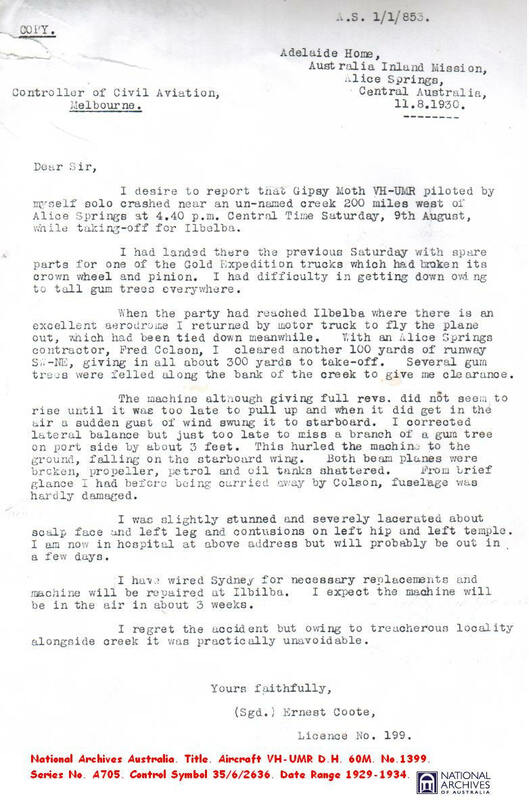 Colson rescued Coote and immediately set out on a 22 hour journey to Alice Springs, he left a note, explaining the situation, for Blakeley and the men who were expected at the creek on the afternoon of the following day. It is probably at this point in Blakeley's narrative, Dream Millions, that many readers and researchers have become thoroughly confused, as Blakeley apparently does, as to the location of Ai Ai or Taylor's Creek. Both Stapleton and Marshall-Stoneking have noted Blakeley's erratic recording of locations and sequence of events, and Blakeley surely muddles events and places here. To untangle Blakeley's route it is best to start with the expeditions arrival at Dashwood Creek on 29/7/30. Both Coote and Blakeley agree that all vehicles are in working order, the Captain is still with the party, the radio doesn't work and the water in Houston's Soak is clear and cold, a place of fond memories for the men; but specifically east of Haasts Bluff. A couple of days later on 31/7/30, the expedition continued west, and here the confusion begins. 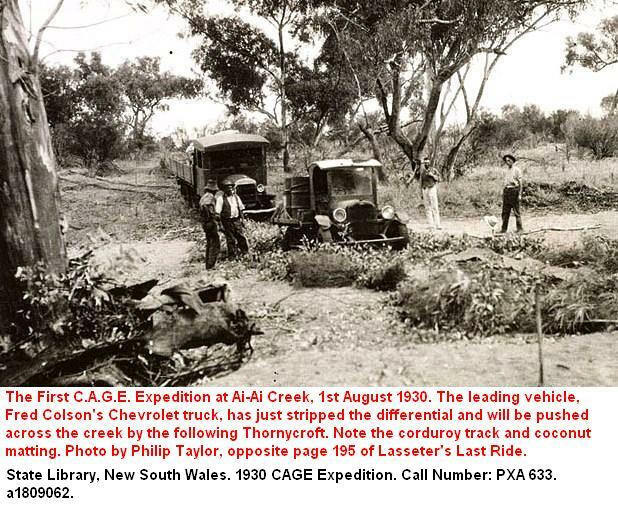 Blakeley has Colson's vehicle breaking the differential at the first major creek crossing after the Dashwood but before the Derwent and certainly still east of Haasts Bluff. At page 69 of Dream Millions on 10/8/30, Blakeley, Sutherland and Taylor pull up at Dashwood Creek at 2 o'clock in the afternoon and find the wreck of the Golden Quest and Colson's note. Then at page 70 Blakeley reflects on the merits of Taylor's camp while he waits beside the wrecked plane. On a second search mission the men return over their eastern track looking for Colson who is overdue with petrol and mail, they arrive at Taylor's Creek late in the afternoon and while Sutherland boils the billy, Lasseter inspects the site of the plane crash. The men then travel east until they reach the creek with the bad angle crossing, the Derwent, and camp on the eastern bank that night, here Blakeley places Taylor's Creek, the site of the plane crash, several hours travel west of the Derwent and Haasts Bluff. So by the end of Dream Millions, Blakeley would have the site of the plane crash at both the Dashwood and Taylor's Creek, and Taylor's Creek both east and west of Haasts Bluff. Blakeley's confusion due to poor memory and not keeping a log book of the journey. Fred Blakeley, Dream Millions. 31,33,34,35,62. Coote E. H Hell's Airport 89-91,96. National Archives Australia. Aircraft VH-UMR D.H. 60M. No. 1399. Series No. A705. Control Symbol 35/6/2636. Date Range 1929-1934.